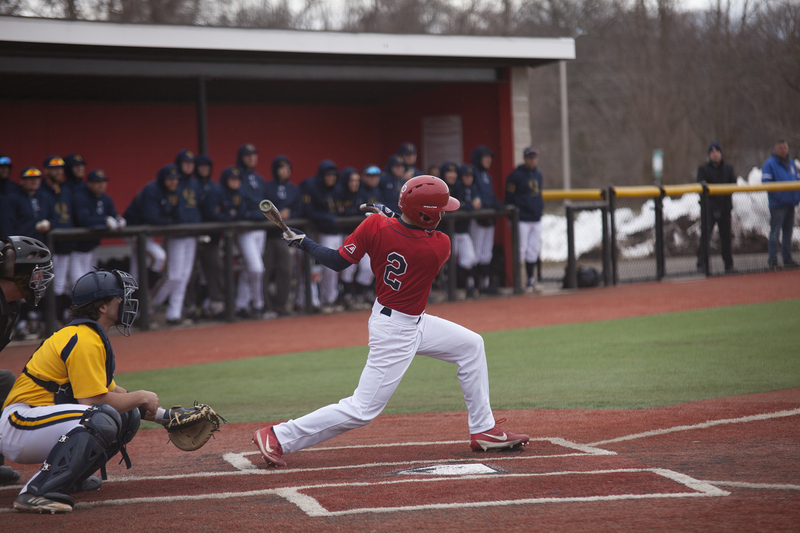 The Stony Brook baseball team took to the road for a conference series against the Maine Black Bears. The team took care of business, winning two of three to secure the series victory and improve to 17-12. Stony Brook also moves into first place in the America East conference at 6-3. The Seawolves sent sophomore starting pitcher Brian Herrmann to the mound on Saturday for the first game of the series, and he dominated. Herrmann went the distance, tossing nine innings of one-run ball on six hits while striking out five. The Black Bears pushed across their only run in the fourth inning, when senior catcher Christopher Bec led off with a single, stole second base and scored off a single from senior catcher Jonathan Bennett. Herrmann then retired the next 12 Black Bear batters in a row. Stony Brook’s offense started off slow, collecting just two hits in the first six innings, finally breaking out in the seventh inning. Freshman catcher John Tuccillo led off with a double down the left field line, and scored when senior infielder Bobby Honeyman doubled to right field. Sophomore outfielder Chris Hamilton drove Honeyman home two batters later on a single to right field that gave Stony Brook the lead for good. The Seawolves added two more runs in the eighth inning thanks to an error by the Black Bears left fielder. Junior infielder Brandon Janofsky led off with a walk and sophomore infielder Nick Grande laced a single to left that was misplayed. The error allowed Janofsky to score and Grande to take second. Tuccillo singled in the next at-bat to drive Grande home, and make it 4-1 Seawolves. Seawolves junior starting pitcher Bret Clarke got off to a rough start in the second game of the series. Junior infielder Jeremy Pena led off the bottom of the first with a triple to left field, and scored two batters later on a double play ground ball. The Seawolves picked Clarke up with two runs in the top of the second, before Clarke got into another jam in the bottom half of the inning. Clarke walked Bennett to start the inning, and the runner advanced to second on a bunt. Junior outfielder Colin Ridley doubled off Clarke in the next at-bat to drive Bennett home and tie the game up. Sophomore catcher Cody Pasic doubled two batters later to drive in Ridley and make it 3-2 Maine. Ridley tacked on another run in the fourth inning, singling home sophomore infielder Kevin Doody from second. Stony Brook earned its runs by working the bases loaded in the second inning. Honeyman and junior catcher Sean Buckhout worked their way on base, and Hamilton laid down a bunt single to fill the bases. Junior outfielder Cristian Montes drove a fly ball to left field deep enough to score Honeyman from third, and Janofsky singled home Buckhout in the next at-bat. The Seawolves did not have many opportunities, but they got the tying run on base in the final inning. Tuccillo and Honeyman singled to get on before Buckhout popped up to shortstop to end the game. Stony Brook jumped on top quickly in the series finale on Sunday. The first two batters reached on singles through the left side, and sophomore outfielder Michael Wilson singled to right field to drive in the first run of the game. Honeyman hit a sacrifice fly to center to drive in a second, and Hamilton singled two batters later to give Stony Brook a 3-0 lead in the first inning. Redshirt-sophomore starting pitcher Greg Marino got into a jam early, allowing a run in the first inning on two hits. Marino shut the door on the Black Bears afterwards, retiring the next 13 batters he faced. Marino exited the game in the seventh with a 5-1 lead after walking the leadoff batter, and that runner would score on a fielder’s choice for Maine’s only other run of the game. Senior closer Aaron Pinto entered the game in the eighth inning and secured the victory, throwing two scoreless innings for his eighth save of the season. Pinto is now tied with former teammate Cam Stone for the school record for saves in a season, and is tied for third on the school’s all-time saves list with 11. Stony Brook returns home briefly for two games against Iona and Central Connecticut State on Tuesday, April 10 and Wednesday, April 11, respectively. Stony Brook has split the season series with Iona 1-1, and has not played Central Connecticut State this season.